Taka Juba is father to Kohki in Willow and a member of the Diversity Committee. It is universally accepted that all human beings are equal in dignity and rights. Not only are diversity and inclusiveness moral imperatives, but they are also beneficial for everyone. As we strategically focus on supporting and growing diverse communities within our classrooms, we reflect on what this initiative really means for our school and our children. What does a truly diverse classroom look like? The answer is: it looks like a reflection of the multifaceted city, and world, in which we live. Our classrooms are vibrant communities of different races, ethnicities, genders, sexual identities, socioeconomics, physical and mental abilities, political opinions, religions, and nationalities. Our families and faculty speak over 14 different languages. What does this mean for our children? Studies have shown that diversity in schools increases academic performance for all students. Learning and growing amongst others who are different from oneself enhances one’s creativity and critical thinking skills. It encourages the search for novel information and perspectives, leading to better decision making and problem solving. When children are led to accept, appreciate, and honor those differences, it also bolsters empathy. This is the rich and open-minded environment we nurture and strive towards. The growth and well-being of all peoples are interrelated. Diversity is not a zero sum game- all benefit from diversity. However, diversity itself is not enough to assure that all are equal in dignity and rights and that all benefit from it; we must also be inclusive by embracing and integrating the uniqueness of each child. We are all still learning how to peacefully co-exist and navigate an increasingly globalizing and diverse society. A diverse school environment is the best starting point to doing so. 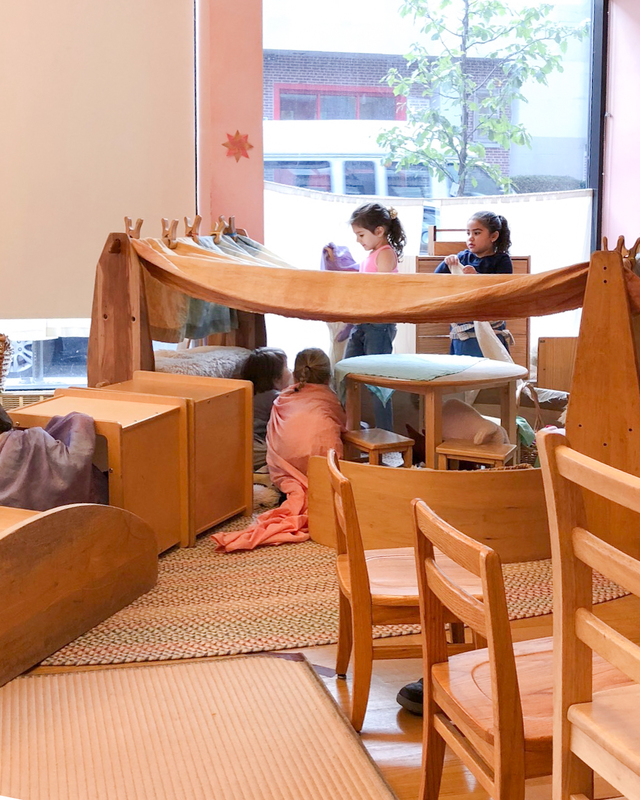 LGBTQ + Identity Development: A Presentation and Q&A with Parents and Caregivers at Brooklyn Waldorf School will take place on November 9th at 6:30pm. A live recording of Maria Noland’s NAS Presentation, Educating to Freedom as a Matter of Social Justice, is now available to listen to! Halloween at New Amsterdam School is a festive time of making pumpkin candles, carving Jack O'Lanterns, singing spooky songs (for grades one and up! ), and the annual elementary school costume parade. This year we saw Cleopatra, The White Witch, a Peacock, and an Eagle, among many others. Warmest wishes for a soulful evening! Choosing a school where your five-year-old will not sit at circle time, learning to spell and calculate, but instead will gallop on an imaginary pony to pick apples at the orchard, may feel like a radical choice. It is! And what is this about "rolling burritos" in the Juniper class? Why are these activities so important that you would choose a school based on them? Because touch and movement provide the foundation for all of your child's future experiences of himself and his environment. And our current system of education does not acknowledge this reality, nor does it consider the future impact not-moving has on your child and those around her. Come to the parent evenings in the early childhood classrooms next week to learn more about the four foundational senses you've been reading about these last weeks and to experience some movement for yourself! Please sign up for a Parent/Teacher conference with your class teacher. All meetings will take place on Monday, November 12th. See your teacher for available time slots. Please note: there will be NO SCHOOL on this day, and conferences are for parents only. Join the garden committee on Sat 11/10 & Sun 11/11 from 10am to 2pm both days. No gardening experience necessary! It’s time to pool our skills, talents, and efforts to gather donations for our Winter Auction! Please ask your friends, neighbors, and local businesses if they are willing to donate too. You can enter donations through the link below or email auction@newamsterdamschool.org. The Winter Auction goes live the last week of November and closes on December 9th. Please contact Jennifer if you would like to form an evening book group for Simplicity Parenting by Kim John Payne. We are incredibly grateful for the time our parents spend volunteering at NAS. Please remember to log any and all hours you give to the school on the form in the Parent Portal (and linked below). We use these numbers to show how involved our parent body is, which helps our school receive funding and grants. 3. Shop as normal and a percentage of what you spend is automatically donated to our school!